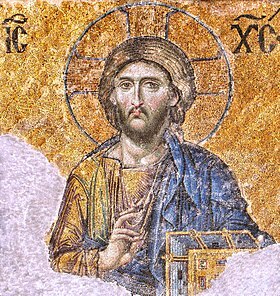 One of the most famous of the surviving Byzantine mosaics of the Hagia Sophia in Constantinople – the image of Christ Pantocrator on the walls of the upper southern gallery. Christ is flanked by the Virgin Mary and John the Baptist. The mosaics were made in the 12th century. A number of states contemporary with the Byzantine Empire were culturally influenced by it, without actually being part of it (the "Byzantine commonwealth"). These included the Rus, as well as some non-Orthodox states like the Republic of Venice, which separated from the Byzantine empire in the 10th century, and the Kingdom of Sicily, which had close ties to the Byzantine Empire and had also been a Byzantine possession until the 10th century with a large Greek-speaking population persisting into the 12th century. Other states having a Byzantine artistic tradition had oscillated throughout the Middle Ages between being part of the Byzantine empire and having periods of independence, such as Serbia and Bulgaria. After the fall of the Byzantine capital of Constantinople in 1453, art produced by Eastern Orthodox Christians living in the Ottoman Empire was often called "post-Byzantine." Certain artistic traditions that originated in the Byzantine Empire, particularly in regard to icon painting and church architecture, are maintained in Greece, Cyprus, Serbia, Bulgaria, Romania, Russia and other Eastern Orthodox countries to the present day. Byzantine art originated and evolved from the Christianized Greek culture of the Eastern Roman Empire; content from both Christianity and classical Greek mythology were artistically expressed through Hellenistic modes of style and iconography. The art of Byzantium never lost sight of its classical heritage; the Byzantine capital, Constantinople, was adorned with a large number of classical sculptures, although they eventually became an object of some puzzlement for its inhabitants (however, Byzantine beholders showed no signs of puzzlement towards other forms of classical media such as wall paintings). The basis of Byzantine art is a fundamental artistic attitude held by the Byzantine Greeks who, like their ancient Greek predecessors, "were never satisfied with a play of forms alone, but stimulated by an innate rationalism, endowed forms with life by associating them with a meaningful content." Although the art produced in the Byzantine Empire was marked by periodic revivals of a classical aesthetic, it was above all marked by the development of a new aesthetic defined by its salient "abstract", or anti-naturalistic character. If classical art was marked by the attempt to create representations that mimicked reality as closely as possible, Byzantine art seems to have abandoned this attempt in favor of a more symbolic approach. The nature and causes of this transformation, which largely took place during late antiquity, have been a subject of scholarly debate for centuries. Giorgio Vasari attributed it to a decline in artistic skills and standards, which had in turn been revived by his contemporaries in the Italian Renaissance. Although this point of view has been occasionally revived, most notably by Bernard Berenson, modern scholars tend to take a more positive view of the Byzantine aesthetic. Alois Riegl and Josef Strzygowski, writing in the early 20th century, were above all responsible for the revaluation of late antique art. Riegl saw it as a natural development of pre-existing tendencies in Roman art, whereas Strzygowski viewed it as a product of "oriental" influences. Notable recent contributions to the debate include those of Ernst Kitzinger, who traced a "dialectic" between "abstract" and "Hellenistic" tendencies in late antiquity, and John Onians, who saw an "increase in visual response" in late antiquity, through which a viewer "could look at something which was in twentieth-century terms purely abstract and find it representational." 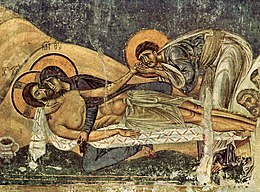 In any case, the debate is purely modern: it is clear that most Byzantine viewers did not consider their art to be abstract or unnaturalistic. As Cyril Mango has observed, "our own appreciation of Byzantine art stems largely from the fact that this art is not naturalistic; yet the Byzantines themselves, judging by their extant statements, regarded it as being highly naturalistic and as being directly in the tradition of Phidias, Apelles, and Zeuxis." Frescoes in Nerezi near Skopje (1164), with their unique blend of high tragedy, gentle humanity, and homespun realism, anticipate the approach of Giotto and other proto-Renaissance Italian artists. The subject matter of monumental Byzantine art was primarily religious and imperial: the two themes are often combined, as in the portraits of later Byzantine emperors that decorated the interior of the sixth-century church of Hagia Sophia in Constantinople. These preoccupations are partly a result of the pious and autocratic nature of Byzantine society, and partly a result of its economic structure: the wealth of the empire was concentrated in the hands of the church and the imperial office, which had the greatest opportunity to undertake monumental artistic commissions. Religious art was not, however, limited to the monumental decoration of church interiors. One of the most important genres of Byzantine art was the icon, an image of Christ, the Virgin, or a saint, used as an object of veneration in Orthodox churches and private homes alike. Icons were more religious than aesthetic in nature: especially after the end of iconoclasm, they were understood to manifest the unique "presence" of the figure depicted by means of a "likeness" to that figure maintained through carefully maintained canons of representation. The illumination of manuscripts was another major genre of Byzantine art. The most commonly illustrated texts were religious, both scripture itself (particularly the Psalms) and devotional or theological texts (such as the Ladder of Divine Ascent of John Climacus or the homilies of Gregory of Nazianzus). Secular texts were also illuminated: important examples include the Alexander Romance and the history of John Skylitzes. The Byzantines inherited the Early Christian distrust of monumental sculpture in religious art, and produced only reliefs, of which very few survivals are anything like life-size, in sharp contrast to the medieval art of the West, where monumental sculpture revived from Carolingian art onwards. Small ivories were also mostly in relief. 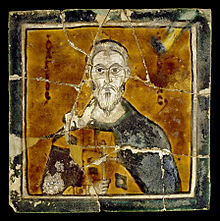 The so-called "minor arts" were very important in Byzantine art and luxury items, including ivories carved in relief as formal presentation Consular diptychs or caskets such as the Veroli casket, hardstone carvings, enamels, glass, jewelry, metalwork, and figured silks were produced in large quantities throughout the Byzantine era. Many of these were religious in nature, although a large number of objects with secular or non-representational decoration were produced: for example, ivories representing themes from classical mythology. Byzantine ceramics were relatively crude, as pottery was never used at the tables of the rich, who ate off Byzantine silver. Byzantine art and architecture is divided into four periods by convention: the Early period, commencing with the Edict of Milan (when Christian worship was legitimized) and the transfer of the imperial seat to Constantinople, extends to AD 842, with the conclusion of Iconoclasm; the Middle, or high period, begins with the restoration of the icons in 843 and culminates in the Fall of Constantinople to the Crusaders in 1204; the Late period includes the eclectic osmosis between Western European and traditional Byzantine elements in art and architecture, and ends with the Fall of Constantinople to the Ottoman Turks in 1453. The term post-Byzantine is then used for later years, whereas "Neo-Byzantine" is used for art and architecture from the 19th century onwards, when the dissolution of the Ottoman Empire prompted a renewed appreciation of Byzantium by artists and historians alike. Two events were of fundamental importance to the development of a unique, Byzantine art. First, the Edict of Milan, issued by the emperors Constantine I and Licinius in 313, allowed for public Christian worship, and led to the development of a monumental, Christian art. Second, the dedication of Constantinople in 330 created a great new artistic centre for the eastern half of the Empire, and a specifically Christian one. Other artistic traditions flourished in rival cities such as Alexandria, Antioch, and Rome, but it was not until all of these cities had fallen - the first two to the Arabs and Rome to the Goths - that Constantinople established its supremacy. Constantine devoted great effort to the decoration of Constantinople, adorning its public spaces with ancient statuary, and building a forum dominated by a porphyry column that carried a statue of himself. Major Constantinopolitan churches built under Constantine and his son, Constantius II, included the original foundations of Hagia Sophia and the Church of the Holy Apostles. The next major building campaign in Constantinople was sponsored by Theodosius I. The most important surviving monument of this period is the obelisk and base erected by Theodosius in the Hippodrome which, with the large silver dish called the Missorium of Theodosius I, represents the classic examples of what is sometimes called the "Theodosian Renaissance". The earliest surviving church in Constantinople is the Basilica of St. John at the Stoudios Monastery, built in the fifth century. Miniatures of the 6th-century Rabula Gospel (a Byzantine Syriac Gospel) display the more abstract and symbolic nature of Byzantine art. Due to subsequent rebuilding and destruction, relatively few Constantinopolitan monuments of this early period survive. However, the development of monumental early Byzantine art can still be traced through surviving structures in other cities. For example, important early churches are found in Rome (including Santa Sabina and Santa Maria Maggiore), and in Thessaloniki (the Rotunda and the Acheiropoietos Basilica). A number of important illuminated manuscripts, both sacred and secular, survive from this early period. Classical authors, including Virgil (represented by the Vergilius Vaticanus and the Vergilius Romanus) and Homer (represented by the Ambrosian Iliad), were illustrated with narrative paintings. Illuminated biblical manuscripts of this period survive only in fragments: for example, the Quedlinburg Itala fragment is a small portion of what must have been a lavishly illustrated copy of 1 Kings. Early Byzantine art was also marked by the cultivation of ivory carving. Ivory diptychs, often elaborately decorated, were issued as gifts by newly appointed consuls. Silver plates were another important form of luxury art: among the most lavish from this period is the Missorium of Theodosius I. Sarcophagi continued to be produced in great numbers. 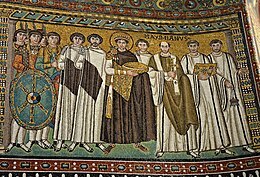 Mosaic from San Vitale in Ravenna, showing the Emperor Justinian and Bishop Maximian, surrounded by clerics and soldiers. Significant changes in Byzantine art coincided with the reign of Justinian I (527–565). Justinian devoted much of his reign to reconquering Italy, North Africa and Spain. He also laid the foundations of the imperial absolutism of the Byzantine state, codifying its laws and imposing his religious views on all his subjects by law. A significant component of Justinian's project of imperial renovation was a massive building program, which was described in a book, the Buildings, written by Justinian's court historian, Procopius. Justinian renovated, rebuilt, or founded anew countless churches within Constantinople, including Hagia Sophia, which had been destroyed during the Nika riots, the Church of the Holy Apostles, and the Church of Saints Sergius and Bacchus. Justinian also built a number of churches and fortifications outside of the imperial capital, including Saint Catherine's Monastery on Mount Sinai in Egypt, Basilica of Saint Sofia in Sofia and the Basilica of St. John in Ephesus. Several major churches of this period were built in the provinces by local bishops in imitation of the new Constantinopolitan foundations. The Basilica of San Vitale in Ravenna, was built by Bishop Maximianus. The decoration of San Vitale includes important mosaics of Justinian and his empress, Theodora, although neither ever visited the church. Also of note is the Euphrasian Basilica in Poreč. Archeological discoveries in the 19th and 20th centuries unearthed a large group of Early Byzantine mosaics in the Middle East. The eastern provinces of the Eastern Roman and later the Byzantine Empires inherited a strong artistic tradition from the Late Antiquity. Christian mosaic art flourished in this area from the 4th century onwards. The tradition of making mosaics was carried on in the Umayyad era until the end of the 8th century. The most important surviving examples are the Madaba Map, the mosaics of Mount Nebo, Saint Catherine's Monastery and the Church of St Stephen in ancient Kastron Mefaa (now Umm ar-Rasas). 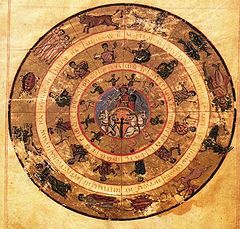 The first fully preserved illuminated biblical manuscripts date to the first half of the sixth century, most notably the Vienna Genesis, the Rossano Gospels, and the Sinope Gospels. The Vienna Dioscurides is a lavishly illustrated botanical treatise, presented as a gift to the Byzantine aristocrat Julia Anicia. Important ivory sculptures of this period include the Barberini ivory, which probably depicts Justinian himself, and the Archangel ivory in the British Museum. Silver plate continued to be decorated with scenes drawn from classical mythology; for example, a plate preserved in the Cabinet des Médailles, Paris, depicts Hercules wrestling the Nemean lion. The Age of Justinian was followed by a political decline, since most of Justinian's conquests were lost and the Empire faced acute crisis with the invasions of the Avars, Slavs, Persians and Arabs in the 7th century. Constantinople was also wracked by religious and political conflict. The most significant surviving monumental projects of this period were undertaken outside of the imperial capital. The church of Hagios Demetrios in Thessaloniki was rebuilt after a fire in the mid-seventh century. The new sections include mosaics executed in a remarkably abstract style. The church of the Koimesis in Nicaea (present-day Iznik), destroyed in the early 20th century but documented through photographs, demonstrates the simultaneous survival of a more classical style of church decoration. The churches of Rome, still a Byzantine territory in this period, also include important surviving decorative programs, especially Santa Maria Antiqua, Sant'Agnese fuori le mura, and the Chapel of San Venanzio in San Giovanni in Laterano. Byzantine mosaicists probably also contributed to the decoration of the early Umayyad monuments, including the Dome of the Rock in Jerusalem and the Great Mosque of Damascus. Important works of luxury art from this period include the silver David Plates, produced during the reign of Emperor Heraclius, and depicting scenes from the life of the Hebrew king David. The most notable surviving manuscripts are Syriac gospel books, such as the so-called Syriac Bible of Paris. However, the London Canon Tables bear witness to the continuing production of lavish gospel books in Greek. The period between Justinian and iconoclasm saw major changes in the social and religious roles of images within Byzantium. The veneration of acheiropoieta, or holy images "not made by human hands," became a significant phenomenon, and in some instances these images were credited with saving cities from military assault. By the end of the seventh century, certain images of saints had come to be viewed as "windows" through which one could communicate with the figure depicted. Proskynesis before images is also attested in texts from the late seventh century. These developments mark the beginnings of a theology of icons. At the same time, the debate over the proper role of art in the decoration of churches intensified. Three canons of the Quinisext Council of 692 addressed controversies in this area: prohibition of the representation of the cross on church pavements (Canon 73), prohibition of the representation of Christ as a lamb (Canon 82), and a general injunction against "pictures, whether they are in paintings or in what way so ever, which attract the eye and corrupt the mind, and incite it to the enkindling of base pleasures" (Canon 100). Intense debate over the role of art in worship led eventually to the period of "Byzantine iconoclasm." Sporadic outbreaks of iconoclasm on the part of local bishops are attested in Asia Minor during the 720s. In 726, an underwater earthquake between the islands of Thera and Therasia was interpreted by Emperor Leo III as a sign of God's anger, and may have led Leo to remove a famous icon of Christ from the Chalke Gate outside the imperial palace. However, iconoclasm probably did not become imperial policy until the reign of Leo's son, Constantine V. The Council of Hieria, convened under Constantine in 754, proscribed the manufacture of icons of Christ. This inaugurated the Iconoclastic period, which lasted, with interruptions, until 843. While iconoclasm severely restricted the role of religious art, and led to the removal of some earlier apse mosaics and (possibly) the sporadic destruction of portable icons, it never constituted a total ban on the production of figural art. Ample literary sources indicate that secular art (i.e. hunting scenes and depictions of the games in the hippodrome) continued to be produced, and the few monuments that can be securely dated to the period (most notably the manuscript of Ptolemy's "Handy Tables" today held by the Vatican) demonstrate that metropolitan artists maintained a high quality of production. Major churches dating to this period include Hagia Eirene in Constantinople, which was rebuilt in the 760s following its destruction by an earthquake in 740. The interior of Hagia Eirene, which is dominated by a large mosaic cross in the apse, is one of the best-preserved examples of iconoclastic church decoration. The church of Hagia Sophia in Thessaloniki was also rebuilt in the late 8th century. Certain churches built outside of the empire during this period, but decorated in a figural, "Byzantine," style, may also bear witness to the continuing activities of Byzantine artists. Particularly important in this regard are the original mosaics of the Palatine Chapel in Aachen (since either destroyed or heavily restored) and the frescoes in the Church of Maria foris portas in Castelseprio. The rulings of the Council of Hieria were reversed by a new church council in 843, celebrated to this day in the Eastern Orthodox Church as the "Triumph of Orthodoxy." In 867, the installation of a new apse mosaic in Hagia Sophia depicting the Virgin and Child was celebrated by the Patriarch Photios in a famous homily as a victory over the evils of iconoclasm. Later in the same year, the Emperor Basil I, called "the Macedonian," acceded to the throne; as a result the following period of Byzantine art has sometimes been called the "Macedonian Renaissance", although the term is doubly problematic (it was neither "Macedonian", nor, strictly speaking, a "Renaissance"). In the 9th and 10th centuries, the Empire's military situation improved, and patronage of art and architecture increased. New churches were commissioned, and the standard architectural form (the "cross-in-square") and decorative scheme of the Middle Byzantine church were standardised. Major surviving examples include Hosios Loukas in Boeotia, the Daphni Monastery near Athens and Nea Moni on Chios. There was a revival of interest in the depiction of subjects from classical mythology (as on the Veroli Casket) and in the use of a "classical" style to depict religious, and particularly Old Testament, subjects (of which the Paris Psalter and the Joshua Roll are important examples). The Macedonian period also saw a revival of the late antique technique of ivory carving. Many ornate ivory triptychs and diptychs survive, such as the Harbaville Triptych and a triptych at Luton Hoo, dating from the reign of Nicephorus Phocas. The Macedonian emperors were followed by the Komnenian dynasty, beginning with the reign of Alexios I Komnenos in 1081. Byzantium had recently suffered a period of severe dislocation following the Battle of Manzikert in 1071 and the subsequent loss of Asia Minor to the Turks. However, the Komnenoi brought stability to the empire (1081–1185) and during the course of the twelfth century their energetic campaigning did much to restore the fortunes of the empire. The Komnenoi were great patrons of the arts, and with their support Byzantine artists continued to move in the direction of greater humanism and emotion, of which the Theotokos of Vladimir, the cycle of mosaics at Daphni, and the murals at Nerezi yield important examples. Ivory sculpture and other expensive mediums of art gradually gave way to frescoes and icons, which for the first time gained widespread popularity across the Empire. Apart from painted icons, there were other varieties - notably the mosaic and ceramic ones. Some of the finest Byzantine work of this period may be found outside the Empire: in the mosaics of Gelati, Kiev, Torcello, Venice, Monreale, Cefalù and Palermo. For instance, Venice's Basilica of St Mark, begun in 1063, was based on the great Church of the Holy Apostles in Constantinople, now destroyed, and is thus an echo of the age of Justinian. The acquisitive habits of the Venetians mean that the basilica is also a great museum of Byzantine artworks of all kinds (e.g., Pala d'Oro). Centuries of continuous Roman political tradition and Hellenistic civilization underwent a crisis in 1204 with the sacking of Constantinople by the Venetian and French knights of the Fourth Crusade, a disaster from which the Empire recovered in 1261 albeit in a severely weakened state. Steven Runciman, a noted 20th-century historian of the Crusades, would write in 1954: "There was never a greater crime against humanity than the Fourth Crusade." The destruction by sack or subsequent neglect of the city's secular architecture in particular has left us with an imperfect understanding of Byzantine art. Although the Byzantines regained the city in 1261, the Empire was thereafter a small and weak state confined to the Greek peninsula and the islands of the Aegean. During their half-century of exile, however, the last great flowing of Anatolian Hellenism began. As Nicaea emerged as the center of opposition under the Laskaris emperors, it spawned a renaissance, attracting scholars, poets, and artists from across the Byzantine world. A glittering court emerged as the dispossessed intelligentsia found in the Hellenic side of their traditions a pride and identity unsullied by association with the hated "latin" enemy. With the recapture of the capital under the new Palaeologan Dynasty, Byzantine artists developed a new interest in landscapes and pastoral scenes, and the traditional mosaic-work (of which the Chora Church in Constantinople is the finest extant example) gradually gave way to detailed cycles of narrative frescoes (as evidenced in a large group of Mystras churches). The icons, which became a favoured medium for artistic expression, were characterized by a less austere attitude, new appreciation for purely decorative qualities of painting and meticulous attention to details, earning the popular name of the Paleologan Mannerism for the period in general. Venice came to control Byzantine Crete by 1212, and Byzantine artistic traditions continued long after the Ottoman conquest of the last Byzantine successor state in 1461. The Cretan school, as it is today known, gradually introduced Western elements into its style, and exported large numbers of icons to the West. The tradition's most famous artist was El Greco. 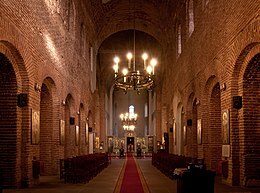 Interior view with the frescoes dating back to 1259, Boyana Church in Sofia, UNESCO World Heritage List landmark. The splendour of Byzantine art was always in the mind of early medieval Western artists and patrons, and many of the most important movements in the period were conscious attempts to produce art fit to stand next to both classical Roman and contemporary Byzantine art. This was especially the case for the imperial Carolingian art and Ottonian art. Luxury products from the Empire were highly valued, and reached for example the royal Anglo-Saxon Sutton Hoo burial in Suffolk of the 620s, which contains several pieces of silver. Byzantine silks were especially valued and large quantities were distributed as diplomatic gifts from Constantinople. There are records of Byzantine artists working in the West, especially during the period of iconoclasm, and some works, like the frescos at Castelseprio and miniatures in the Vienna Coronation Gospels, seem to have been produced by such figures. In particular, teams of mosaic artists were dispatched as diplomatic gestures by emperors to Italy, where they often trained locals to continue their work in a style heavily influenced by Byzantium. Venice and Norman Sicily were particular centres of Byzantine influence. The earliest surviving panel paintings in the West were in a style heavily influenced by contemporary Byzantine icons, until a distinctive Western style began to develop in Italy in the Trecento; the traditional and still influential narrative of Vasari and others has the story of Western painting begin as a breakaway by Cimabue and then Giotto from the shackles of the Byzantine tradition. In general, Byzantine artistic influence on Europe was in steep decline by the 14th century if not earlier, despite the continued importance of migrated Byzantine scholars in the Renaissance in other areas. Islamic art began with artists and craftsmen mostly trained in Byzantine styles, and though figurative content was greatly reduced, Byzantine decorative styles remained a great influence on Islamic art, and Byzantine artists continued to be imported for important works for some time, especially for mosaics. The Byzantine era properly defined came to an end with the fall of Constantinople to the Ottoman Turks in 1453, but by this time the Byzantine cultural heritage had been widely diffused, carried by the spread of Orthodox Christianity, to Bulgaria, Serbia, Romania and, most importantly, to Russia, which became the centre of the Orthodox world following the Ottoman conquest of the Balkans. Even under Ottoman rule, Byzantine traditions in icon-painting and other small-scale arts survived, especially in the Venetian-ruled Crete and Rhodes, where a "post-Byzantine" style under increasing Western influence survived for a further two centuries, producing artists including El Greco whose training was in the Cretan School which was the most vigorous post-Byzantine school, exporting great numbers of icons to Europe. The willingness of the Cretan School to accept Western influence was atypical; in most of the post-Byzantine world "as an instrument of ethnic cohesiveness, art became assertively conservative during the Turcocratia" (period of Ottoman rule). Russian icon painting began by entirely adopting and imitating Byzantine art, as did the art of other Orthodox nations, and has remained extremely conservative in iconography, although its painting style has developed distinct characteristics, including influences from post-Renaissance Western art. All the Eastern Orthodox churches have remained highly protective of their traditions in terms of the form and content of images and, for example, modern Orthodox depictions of the Nativity of Christ vary little in content from those developed in the 6th century. ^ Michelis 1946; Weitzmann 1981. ^ Kitzinger 1977, pp. 1‒3. ^ Michelis 1946; Ainalov 1961, "Introduction", pp. 3‒8; Stylianou & Stylianou 1985, p. 19; Hanfmann 1962, "Early Christian Sculpture", p. 42; Weitzmann 1984. ^ Cyril 1965, pp. 53‒75. ^ Ainalov 1961, "The Hellenistic Character of Byzantine Wall Painting", pp. 185‒214. ^ Weitzmann 1981, p. 350. ^ Elsner 2002, pp. 358‒379. ^ Onians 1980, pp. 1‒23. ^ Mango 1963, p. 65. ^ Belting & Jephcott 1994. ^ Fowden 1991, pp. 119‒131; Bauer 1996. ^ Spieser 1984; Ćurčić 2000. ^ Tr. H.B. Dewing, Procopius VII (Cambridge, 1962). ^ Dark & Özgümüş 2002, pp. 393‒413. ^ Bardill 2000, pp. 1‒11; Mathews 2005. ^ Forsyth & Weitzmann 1973. ^ Cutler 1993, pp. 329‒339. ^ Wright 1986, pp. 75‒79. ^ Brubaker 2004, pp. 63‒90. ^ Barber 1991, pp. 43‒60. ^ Creswell 1969; Flood 2001. ^ Leader 2000, pp. 407‒427. ^ Brubaker 1998, pp. 1215‒1254. ^ Bryer & Herrin 1977; Brubaker & Haldon 2001. ^ Stein 1980; The story of the Chalke Icon may be a later invention: Auzépy 1990, pp. 445‒492. ^ Wright 1985, pp. 355‒362. ^ Bryer & Herrin 1977, Robin Cormack, "The Arts during the Age of Iconoclasm". ^ Runciman 1987, p. 130. ^ Byron, Robert (October 1929). "Greco: The Epilogue to Byzantine Culture". The Burlington Magazine for Connoisseurs. 55 (319): 160–174. JSTOR 864104. ^ Procopiou, Angelo G. (March 1952). "El Greco and Cretan Painting". The Burlington Magazine. 94 (588): 76–74. JSTOR 870678. ^ Kessler 1988, p. 166. Ainalov, D.V. (1961). The Hellenistic Origins of Byzantine Art. New Brunswick: Rutgers University Press. Almagro-Gorbea, M., ed. (2000). El Disco de Teodosio. Madrid: Real Academia de la Historia. ISBN 9788489512603. Ash, John (1995). A Byzantine Journey. London: Random House Incorporated. ISBN 9780679409342. Auzépy, M.-F. (1990). "La destruction de l'icône du Christ de la Chalcé par Léon III: propagande ou réalité?". Byzantion. 60: 445‒492. Barber, C. (1991). "The Koimesis Church, Nicaea: The Limits of Representation on the Eve of Iconoclasm". Jahrbuch der österreichischen Byzantinistik. 41: 43‒60. Bardill, J. (2000). "The Church of Sts. Sergius and Bacchus in Constantinople and the Monophysite Refugees". Dumbarton Oaks Papers. 54: 1‒11. doi:10.2307/1291830. JSTOR 1291830. Bassett, Sarah (2004). The Urban Image of Late Antique Constantinople. Cambridge: Cambridge University Press. ISBN 9780521827232. Bauer, Franz Alto (1996). Stadt, Platz und Denkmal in der Spätantike. Mainz: P. von Zabern. ISBN 9783805318426. Belting, Hans; Jephcott (tr. ), Edmund (1994). Likeness and Presence: A History of the Image before the Era of Art. Chicago: Chicago University Press. ISBN 9780226042152. Berenson, Bernard (1954). The Arch of Constantine, or, the Decline of Form. London: Chapman and Hall. Brendel, Otto J. (1979). Prolegomena to the Study of Roman Art. New Haven: Yale University Press. ISBN 9780300022681. Brubaker, Leslie; Haldon, John (2001). Byzantium in the Iconoclast Era (ca. 680-850): The Sources. Birmingham: Ashgate. Brubaker, L. (1998). "Icons before iconoclasm?, Morfologie sociali e culturali in europa fra tarda antichita e alto medioevo". Settimane di Studio del Centro Italiano di Studi Sull' Alto Medioevo. 45: 1215‒1254. Brubaker, L. (2004). "Elites and Patronage in Early Byzantium: The Evidence from Hagios Demetrios in Thessalonike". In Haldon, John; et al. The Byzantine and Early Islamic Near East: Elites Old and New. Princeton: Princeton University Press. pp. 63‒90. Bryer, A.; Herrin, Judith, eds. (1977). Iconoclasm: Papers Given at the Ninth Spring Symposium of Byzantine Studies, University of Birmingham, March 1975. Birmingham: Center for Byzantine Studies. ISBN 9780704402263. Cavallo, Guglielmo (1992). Il codex purpureus rossanensis. Rome. Creswell, Keppel A.C. (1969). Early Muslim Architecture. New York: Clarendon Press. Ćurčić, Slobodan (2000). Some Observations and Questions Regarding Early Christian Architecture in Thessaloniki. Thessaloniki: Υπουργείον Πολιτισμού: Εφορεία Βυζαντινών Αρχαιοτήτων Θεσσαλονίκης. ISBN 9789608674905. Cutler, A. (1993). "Barberiniana: Notes on the Making, Content, and Provenance of Louvre OA. 9063". Tesserae: Festschrift für Josef Engemann, Jahrbuch für Antike und Christentum, Ergänzungsband. 18: 329‒339. Dark, K.; Özgümüş, F. (2002). "New Evidence for the Byzantine Church of the Holy Apostles from Fatih Camii, Istanbul". Oxford Journal of Archaeology. 21 (4): 393‒413. doi:10.1111/1468-0092.00170. Deichmann, Friedrich Wilhelm (1969). Ravenna: Hauptstadt des spätantiken Abendlandes. Wiesbaden: Franz Steiner. ISBN 9783515020053. Delbrueck, R. (1929). Die Consulardiptychen und Verwandte Denkmäler. Berlin: De Gruyter. Dodd, Erica Cruikshank (1961). Byzantine Silver Stamps. Washington: Dumbarton Oaks Research Library and Collection, Trustees for Harvard University. Elsner, J. (2002). "The Birth of Late Antiquity: Riegl and Strzygowski in 1901". Art History. 25 (3): 358‒379. doi:10.1111/1467-8365.00326. Flood, Finbarr Barry (2001). The Great Mosque of Damascus: Studies on the Making of an Umayyad Visual Culture. Leiden: Brill. Forsyth, George H.; Weitzmann, Kurt (1973). The Monastery of St. Catherine at Mount Sinai: The Church and Fortress of Justinian. Ann Arbor: University of Michigan Press. Fowden, Garth (1991). "Constantine's Porphyry Column: The Earliest Literary Allusion". Journal of Roman Studies. 81: 119‒131. doi:10.2307/300493. JSTOR 300493. Grabar, André (1984). L'iconoclasme byzantin: Le dossier archéologique (2nd ed.). Paris: Flammarion. ISBN 9782080126030. Grabar, André (1948). Les peintures de l'évangéliaire de Sinope (Bibliothèque nationale, Suppl. gr. 1286). Paris: Bibliothèque nationale. Haldon, John (1997) . Byzantium in the Seventh Century: The Transformation of a Culture. Cambridge: Cambridge University Press. Hanfmann, George Maxim Anossov (1967). Classical Sculpture. Greenwich, CT: New York Graphic Society. Henck, N. (2001). "Constantius ho Philoktistes?" (PDF). Dumbarton Oaks Papers. 55: 279‒304. doi:10.2307/1291822. JSTOR 1291822. Archived from the original (PDF) on 2014-05-12. Retrieved 2014-09-29. Kessler, Herbert L. (1988). "On the State of Medieval Art History". The Art Bulletin. 70 (2): 166–187. doi:10.1080/00043079.1988.10788561. JSTOR 3051115. Kiilerich, Bente (1998). The Obelisk Base in Constantinople. Rome: G. Bretschneider. Kitzinger, Ernst (1977). Byzantine Art in the Making: Main Lines of Stylistic Development in Mediterranean Art, 3rd‒7th Century. Cambridge: Cambridge University Press. ISBN 978-0571111541. Krautheimer, R. (2000). Rome: Profile of a City. Princeton: Princeton University Press. ISBN 9780691049618. Leader, R. (2000). "The David Plates Revisited: Transforming the Secular in Early Byzantium". Art Bulletin. 82 (3): 407‒427. doi:10.2307/3051395. JSTOR 3051395. Leroy, Jules (1964). Les manuscrits syriaques à peintures conservés dans les bibliothèques d'Europe et d'Orient; contribution à l'étude de l'iconographie des Églises de langue syriaque. Paris: Librairie orientaliste P. Geuthner. Levin, I. (1985). The Quedlinburg Itala: The Oldest Illustrated Biblical Manuscript. Leiden: E.J. Brill. ISBN 9789004070936. Maas, M., ed. (2005). The Cambridge Companion to the Age of Justinian. Cambridge: Cambridge University Press. ISBN 9781139826877. Mainstone, Rowland J. (1997). Hagia Sophia: Architecture, Structure, and Liturgy of Justinian's Great Church. New York: Thames and Hudson. ISBN 9780500279458. Mango, Cyril (1963). "Antique Statuary and the Byzantine Beholder". Dumbarton Oaks Papers. 17: 53‒75. doi:10.2307/1291190. JSTOR 1291190. Mathews, Thomas F. (1971). The Early Churches of Constantinople: Architecture and Liturgy. University Park: Pennsylvania State University Press. Mathews, Thomas F. (2005). "The Palace Church of Sts. Sergius and Bacchus in Constantinople". In Emerick, J.J.; Delliyannis, D.M. Archaeology in Architecture: Studies in Honor of Cecil L. Striker. Mainz: von Zabern. ISBN 9783805334921. Matthiae, Guglielmo (1987). Pittura romana del medioevo. Rome: Fratelli Palombi. ISBN 9788876212345. Mazal, Otto (1998). Der Wiener Dioskurides: Codex medicus Graecus 1 der Österreichischen Nationalbibliothek. Graz: Akademische Druck u. Verlagsanstalt. ISBN 9783201016995. Michelis, Panayotis A. (1946). An Aesthetic Approach to Byzantine Art. Athens. Nordenfalk, Carl (1938). Die spätantiken Kanontafeln. Göteborg: O. Isacsons boktryckeri a.-b. Onians, J. (1980). "Abstraction and Imagination in Late Antiquity". Art History. 3: 1‒23. doi:10.1111/j.1467-8365.1980.tb00061.x. Peschlow, Urs (1977). Die Irenenkirche in Istanbul. Tübingen: E. Wasmuth. Runciman, Steven (1987) . A History of the Crusades: The Kingdom of Acre and the Later Crusades. Cambridge: Cambridge University Press. ISBN 978-0521347723. Spieser, J.-M. (1984). Thessalonique et ses monuments du IVe au VIe siècle. Athens: Ecole française d'Athènes. Stein, D. (1980). Der Beginn des byzantinischen Bilderstreites und seine Entwicklung bis in die 40er Jahre des 8. Jahrhunderts. Munich: Institut für Byzantinistik und Neugriechische Philologie der Universität. Stylianou, Andreas; Stylianou, Judith A. (1985). The Painted Churches of Cyprus: Treasures of Byzantine Art. London: Trigraph for the A.G. Leventis Foundation. Theocharidou, K. (1988). The Architecture of Hagia Sophia, Thessaloniki, from its Erection up to the Turkish Conquest. Oxford: Oxford University Press. Thiel, Andreas (2005). Die Johanneskirche in Ephesos. Wiesbaden: Isd. ISBN 9783895003547. Volbach, Wolfgang Fritz (1976). Elfenbeinarbeiten der Spätantike und des frühen Mittelalters. Mainz: von Zabern. Weitzmann, Kurt (1981). Classical Heritage in Byzantine and Near Eastern Art. London: Variorum Reprints. Weitzmann, Kurt (1984). Greek Mythology in Byzantine Art. Princeton: Princeton University Press. ISBN 9780860780878. Wellesz, Emmy (1960). The Vienna Genesis. London: T. Yoseloff. Wright, D. H. (1985). "The Date of the Vatican Illuminated Handy Tables of Ptolemy and of its Early Additions". Byzantinische Zeitschrift. 78 (2): 355‒362. doi:10.1515/byzs.1985.78.2.355. Wright, D. (1986). "Justinian and an Archangel". Studien zur Spätantiken Kunst Friedrich Wilhelm Deichmann Gewidmet. Mainz. III: 75‒79. Wright, David Herndon (2001). The Roman Vergil and the Origins of Medieval Book Design. Toronto: University of Toronto Press. ISBN 9780802048196. Wright, David Herndon (1993). The Vatican Vergil: A Masterpiece of Late Antique Art. Berkeley: University of California Press. ISBN 9780520072404. Alloa, Emmanuel (2013). "Visual Studies in Byzantium". Journal of Visual Culture. 12 (1): 3‒29. doi:10.1177/1470412912468704. Beckwith, John (1979). Early Christian and Byzantine Art (2nd ed.). Penguin History of Art. ISBN 978-0140560336. Cormack, Robin (2000). 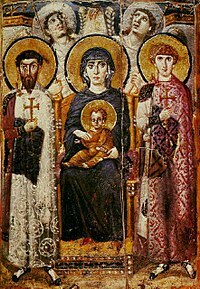 Byzantine Art. Oxford: Oxford University Press. Cormack, Robin (1985). Writing in Gold, Byzantine Society and its Icons. London: George Philip. ISBN 978-054001085-1. Eastmond, Antony (2013). The Glory of Byzantium and Early Christendom. London: Phaidon Press. ISBN 978-0714848105. Evans, Helen C., ed. (2004). Byzantium, Faith and Power (1261‒1557). Metropolitan Museum of Art/Yale University Press. ISBN 978-1588391148. Evans, Helen C. & Wixom, William D. (1997). The Glory of Byzantium: Art and Culture of the Middle Byzantine Era, A.D. 843‒1261. New York: The Metropolitan Museum of Art. OCLC 853250638. Hurst, Ellen (8 August 2014). "A Beginner's Guide to Byzantine Art". Smarthistory. Retrieved 20 April 2016. James, Elizabeth (2007). Art and Text in Byzantine Culture (1 ed.). Cambridge: Cambridge University Press. ISBN 978-0-521-83409-4. Karahan, Anne (2015). "Patristics and Byzantine Meta-Images. Molding Belief in the Divine from Written to Painted Theology". In Harrison, Carol; Bitton-Ashkelony, Brouria; De Bruyn, Théodore. Patristic Studies in the Twenty-First Century. Turnhout: Brepols Publishers. pp. 551–576. ISBN 978-2-503-55919-3. Karahan, Anne (2010). Byzantine Holy Images – Transcendence and Immanence. The Theological Background of the Iconography and Aesthetics of the Chora Church (Orientalia Lovaniensia Analecta No. 176). Leuven-Paris-Walpole, MA: Peeters Publishers. ISBN 978-90-429-2080-4. Karahan, Anne (2016). "Byzantine Visual Culture. Conditions of "Right" Belief and some Platonic Outlooks"". Numen: International Review for the History of Religions (Divine Word and Divine Work: Late Platonism and Religion). Leiden: Koninklijke Brill NV. 63 (2–3): 210–244. doi:10.1163/15685276-12341421. ISSN 0029-5973. Karahan, Anne (2014). "Byzantine Iconoclasm: Ideology and Quest for Power". In Kolrud, K.; Prusac, M. Iconoclasm from Antiquity to Modernity. Farnham Surrey: Ashgate Publishing Ltd. pp. 75‒94. ISBN 978-1-4094-7033-5. Karahan, Anne (2015). "Chapter 10: The Impact of Cappadocian Theology on Byzantine Aesthetics: Gregory of Nazianzus on the Unity and Singularity of Christ". In Dumitraşcu, N. The Ecumenical Legacy of the Cappadocians. New York, NY: Palgrave Macmillan. pp. 159‒184. ISBN 978-1-137-51394-6. Karahan, Anne (2012). "Beauty in the Eyes of God. Byzantine Aesthetics and Basil of Caesarea". Byzantion: Revue Internationale des Études Byzantines. 82: 165‒212. eISSN 2294-6209. ISSN 0378-2506. * Karahan, Anne (2013). "The Image of God in Byzantine Cappadocia and the Issue of Supreme Transcendence". Studia Patristica. 59: 97‒111. ISBN 978-90-429-2992-0. Karahan, Anne (2010). "The Issue of περιχώρησις in Byzantine Holy Images". Studia Patristica. 44: 27‒34. ISBN 978-90-429-2370-6. Gerstel, Sharon E. J.; Lauffenburger, Julie A., eds. (2001). A Lost Art Rediscovered. Pennsylvania State University. ISBN 978-0-271-02139-3. Mango, Cyril, ed. (1972). The Art of the Byzantine Empire, 312‒1453: Sources and Documents. Englewood Cliffs. Obolensky, Dimitri (1974) . The Byzantine Commonwealth: Eastern Europe, 500‒1453. London: Cardinal. ISBN 9780351176449.
http://www.biblionet.gr/book/178713/Ανδρέου,_Ευάγγελος/Γεώργιος_Μάρκου_ο_Αργείος Weitzmann, Kurt, ed. (1979). Age of Spirituality: Late Antique and Early Christian Art, Third to Seventh Century. New York: The Metropolitan Museum of Art. Wikimedia Commons has media related to Byzantine art. "Byzantine art", from the 1911 Encyclopædia Britannica. Anthony Cutler on the economic history of Byzantine mosaics, wall-paintings and icons at Dumbarton Oaks.